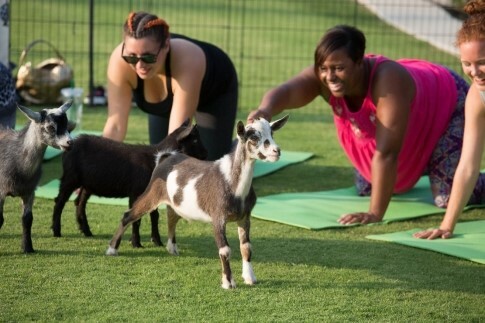 California Goat Yoga is bringing their adorable herd to Anaheim Majestic Garden Hotel. Try out goat yoga with Nigerian dwarf baby goats Oct. 27. When planning a big event, it can be hard to keep everything straight when researching or visiting multiple venues. From costs and catering to design and decor, you have a million things on your mind. After touring location after location, things can start to blend together. The event services team at Anaheim Majestic Garden Hotel has the experience to help you find the perfect venue for your next corporate event, wedding, quinceanera, or party. That’s why we created this handy event venue checklist for you to print out and take to building tours and event planning meetings. It’ll help you keep all the details in order and easily compare and contrast different spaces. From pumpkin spice and cool temperatures to crunchy leaves and Halloween, there are a lot of things to love about the fall season. That is probably why more and more happy couples are choosing to say ‘I do’ in September, October, and November. At Anaheim Majestic Garden Hotel, we’re gearing up for some beautiful fall weddings! Many of our wedding couples have told us they want to incorporate some seasonal flair into the wedding, without going over their budget. Weddings can be expensive…we totally get it. Choosing where to splurge, and where to cut back can be tricky! Luckily, there are many creative ways to save some money on various parts of your wedding so that you can make your budget go farther and allocate more money toward the pieces of your wedding that mean the most to you! Maybe you have the perfect venue in mind, but need to spend less on centerpieces to make it work. Or you’ve got the wedding dress of your dreams pinned to your Pinterest board, but need to cut back elsewhere to get it. Here are some of our favorite low-cost wedding ideas for autumn weddings that you’re sure to “fall” in love with. In the US, we’re big on meetings. In fact, American business people hold around 11 million meetings a day, and 73% of people work on other things during meetings. Why go through all the work of planning and facilitating an event that isn’t going to resonate with your group? Let’s work on making your next corporate event one to remember — one that brings your team closer, engages them, and helps foster that positive company culture that sets your business apart. If you’re looking to shake things up, the corporate meeting and event planners at Anaheim Majestic Garden Hotel will help take your corporate gathering to the next level with out-of-the-box ideas and unexpected surprises people will be talking about for years to come. From the perfect meeting space and equipment to unique hotel amenities and services, we’ve got it all for your next event. Looking for an easy way to cultivate a better corporate culture, connect with your team, and spice things up at the office? If so, you should consider taking your next meeting or event off-site. There are more than a few benefits to getting out of the office and utilizing a different location. In fact, it may be the best thing you ever do for your company, team, or organization. If you’re planning a trip to Disneyland, your smartphone is your best friend. From booking tickets to finding dining locations to monitoring wait times, there are apps that can help you make the most of your time in “the happiest place on earth.” With so many travel and Disney apps, it can be hard to know which apps are the best while exploring the park. Have no fear! Here are 5 mobile apps we think you’ll definitely want to download and check out before heading out to explore all that Disneyland has to offer!